Mirza Asadullah Khan (1797-1869) who wrote with a nom de plume of Asad before choosing Ghalib, which literally means overcoming or overpowering, hailed from a Central Asian family of Aibak Turks who served traditionally as soldier s. Unlike his grandfather who had migrated to India during the reign of Sah Alam II to join army, and his father who also followed the same profession and was killed in an army action in Alwar, Ghalib excelled brilliantly as a poet, prose writer, diarist, and a writer of engrossingly intimate letters. He was born in Agra where the family had settled. He lost his father at the age of five and was brought up by his uncle who also passed away four years later after which he was taken care of by his maternal grandfather. Married at an early age of thirteen, he moved to Delhi where he kept shifting his residence as a tenant in the vicinity of what is now known as old Delhi till he settled down in yet another rented accommodation in a locality called Ballimaran where he died in pain and penury. With little financial security available to him, Ghalib had to make do with difficulty in the early part of his life as he had to do ever after. He sustained mainly on the pension from his uncle’s state but that was both meagre ad irregular, as was the assistance he received from the nobility. His plea to all the possible authorities in the British government as well as his travel to Calcutta to present his case personally did not bring him any financial security. He was a unique individual, who wrote the finest kind of poetry in Urdu and Persian, played chess and dice, borrowed books, drew loan, drank incessantly, violated norms, and got punished by imprisonment but continued with his manners. 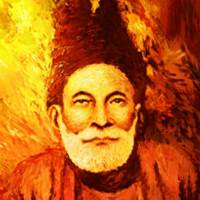 Although Ghalib did not receive any formal education but he learnt his lessons in Arabic, Persian, logic and philosophy from Mulla Abdussamad and grew on his own at an intellectual level. After the demise of Sheikh Ibrahim Zauq who had the privilege of counselling the emperor Bahadur Shah Zafar on his poetry, he was appointed as his mentor, as well as a historian of the Mughal court, which brought him some financial security and the honorifics of Najmuddaulah, Dabeerulmulk, and Nizam Jung, as well as the title of Mirza Nausha. Ghalib stands out for his sparkling wit and tough ratiocination, as well his innovations in technique and diction that distinguish his poetry and prose from all others written before or after him. Negotiating precariously with life at several levels, he died in sickness and was buried in Nizamuddin, beyond the walled city of Delhi. His numerous works, apart from his divan and letters in Urdu and kulliyat of Persian poetry and prose, include Urdu-i-Muallah, a collection of epistles, Taigh-e-Taiz, a rebuttal of a literary work; Qata-i-Burhan, a criticism of Persian lexicon; Panj Ahang, a collection of occasional writings; Mehre Neem Roze, a historical narrative; and Dastumbo, an literary account of 1857 that testify his versatility and rare artistic merit.